Kogarah. Cuisine from around the world, a multi cultural mix to stun the senses and the home of the mighty St George Illawarra Dragons. All this and more on your door step so what's holding you back? If the answer is back pain then Sydney Wide Chiropractic has the answer and can turn your life around. As the leading chiropractor in Kogarah we understand better than anyone how the stresses and trauma of your busy life have a direct impact on your health. The nerves servicing your spinal column need safe, professional and experienced care to maximize your well being and that care has been provided by us for the past 11 years. We don't expect you to simply take our word for it though because we realize we're only successful when you're healthy so check out our testimonials from clients whose expectations we have exceeded. We are not here to lecture you on things you're doing wrong, and we are not here to trap you in a cycle of ongoing chiropractic care that sees you lose time and money. 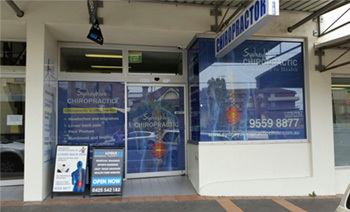 What we are here for, and it's this that has made us the number one choice when it comes to a chiropractor in Kogarah, is resetting your life, removing your pain and handing you the information and skills to better your own future. Through affordable and accredited treatment programs you will be equipped with the skills to improve your own health, an improved knowledge and understanding of the way your brain, spine and nerves interact and most importantly the confidence and ability to go out and achieve your goals on the back of your new found vitality. At Sydney Wide Chiropractic we don't simply treat the symptoms, we correct the underlying causes of your pain and start you on a new path. So if you're ready to wake up to a world that's pain free, stress free and full of movement than get in touch with us today at (02) 9529 4008 or email us at info@sydneychiropracticclinic.com.au to organise treatment today.